Party down with prehistoric style with this dino-themed kit, infused with fascinating facts from our friends at Mental Floss (did you know Thomas Jefferson was an avid fossil collector?). 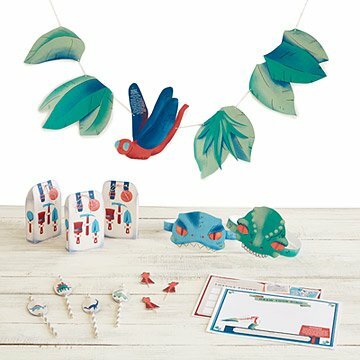 Included is everything you need for Bronto-sized fun: Cake toppers, "carnivores vs. herbivores" straw toppers, jungle vine bunting, "draw your dino" placemats, paleontologist treat bags, fossil record guestbook, "dino dig" photo booth props, a "Pin to Pangea" game, and helmet head party hats. Each part of the kit provides simple yet detailed directions, ensuring you'll pull off a celebration big and little paleontologists alike will dig. Click here for your free download of the Printable Dinosaur Party Kit. Great free activity for kids, my son loved it!